Smooth jazz and soulful ballads fill the air, floating around street corners and parking lots as a crowd gathers to watch a break dancer. Food trucks are corralled like chuck wagons of old while the tantalizing smell of street tacos and gourmet appetizers wafts through the crowd, accompanying intricately displayed artwork in funky studios and multi-story art emporiums. 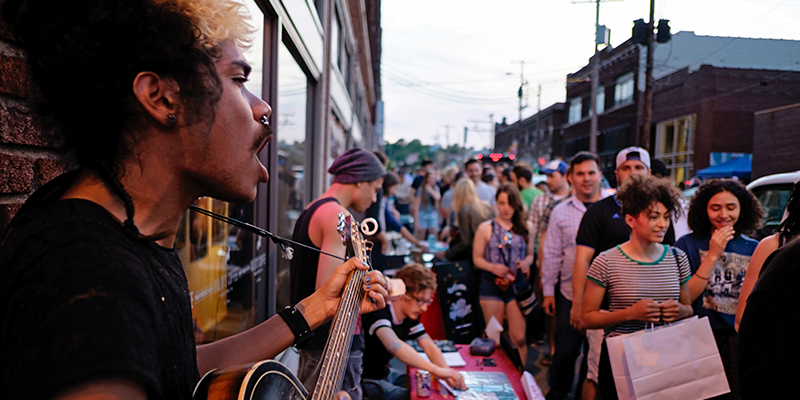 These are the sights, sounds and flavors of First Fridays in the Crossroads Arts District, one of KC’s most unique events in one of its most unique neighborhoods. Visitors and locals alike take to the streets, walking from a pop-up party to a craft brewery to a fine art gallery, a stone’s throw from one another. 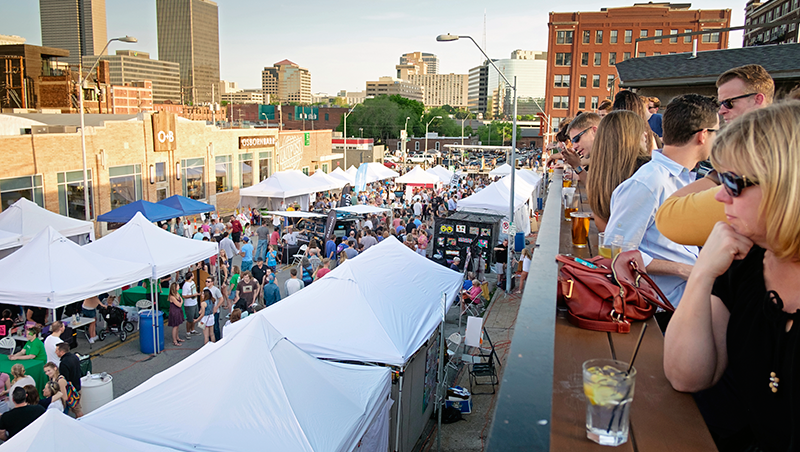 On the first Friday of each month, venture south of Downtown KC—either by KC Streetcar, car, bike or by foot—to experience the avant-garde neighborhood that the arts built. From its epicenter at the intersection of Southwest Boulevard and Baltimore Avenue, the Crossroads extends south to the Freight House District, west to I-35, north to I-70 and east to Truman Road. KC Streetcar riders heading south can jump off at the Kauffman Center stop to wander down on their own or step out at the Crossroads stop in the heart of it all. First Fridays officially begins at 5 p.m. and many of the galleries stay open until at least 9 p.m., but that by no means signals the end of the night, which, depending on where you decide to go, can last into the early morning. Keep in mind that culture is king at First Fridays. 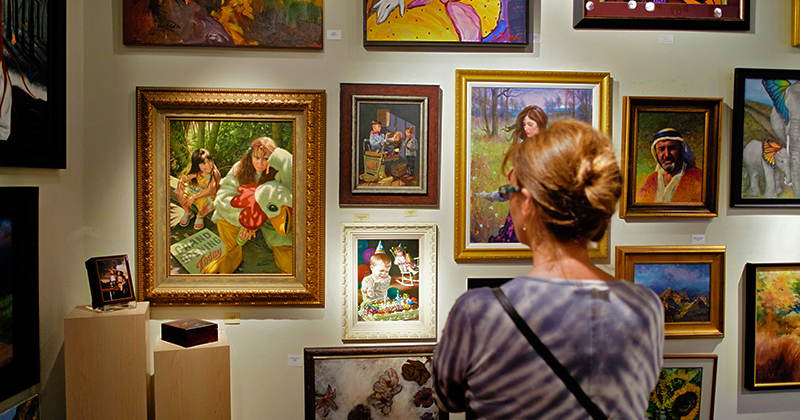 That means art gallery tours at places like Weinberger Fine Art, Leedy-Voulkos Art Center, Blue Gallery and Jones Gallery are musts. Live music is well represented too, thanks to top-notch local venues like Green Lady Lounge, Crossroads KC at Grinders and The Tank Room. Many local retailers throw pop-up parties throughout the district, so be sure to follow their social media accounts for updates on events. Indulge in nostalgia with some serious old-school gaming at both Up-Down and Tapcade, two arcade bars complete with retro games and craft beer selections. Fill your shopping bag at tons of local establishments, including Hammerpress (handcrafted cards and paper goods), Tomboy (hip menswear) and Raygun (crazy-cool T-shirts with Midwest flair). 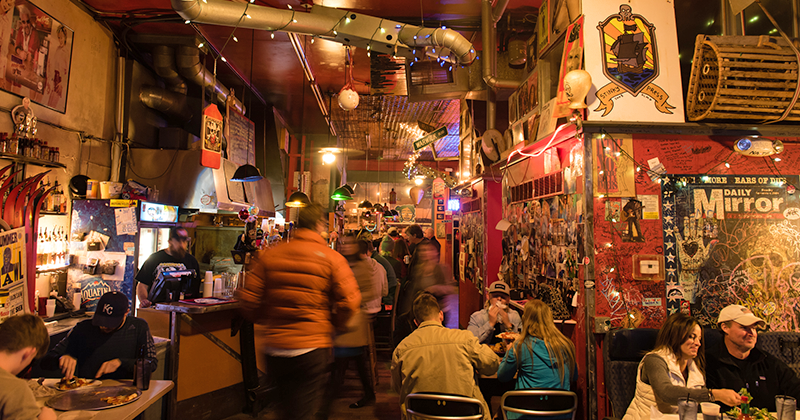 Or, discover curios from countless street vendors and local artists. A wide array of places to dine and enjoy cocktails include tapas at Extra Virgin, German small plates at Affäre or Mexican cuisine at Manny’s of Kansas City; but they can become packed with long waits thanks to their popularity, so plan accordingly. Other local favorites include Nara for stylish, delicious sushi, Blvd Tavern for gastropub grub and Lulu's Thai Noodle Shop for Southeast Asian specialties. Treat yourself at Christopher Elbow Chocolates with First Friday deals and then hang out at Tannin Wine Bar + Kitchen for live tunes and an extensive wine list. Recaffeinate at Messenger Coffee Co. before grabbing a slice at Grinders Pizza. Oh, and don’t forget the food trucks. Many round up at the corner of 18th and McGee while others line the streets en masse. If you’re thirsty, check out any of the new fantastic craft breweries in the Crossroads, including Border Brewing Company, Torn Label and Double Shift, all within a 10-minute walk of one another. 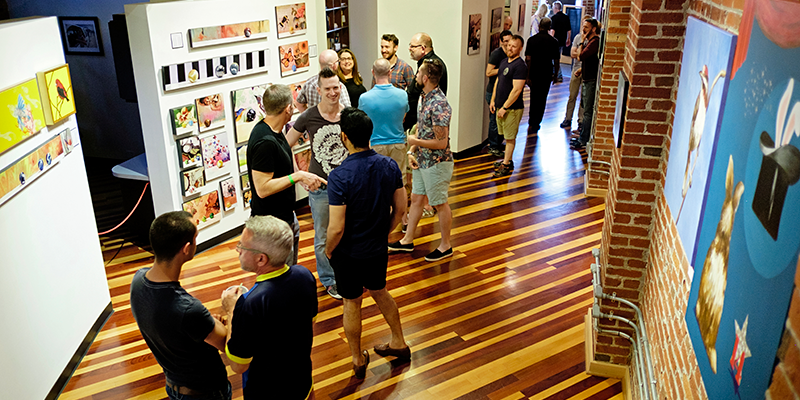 The First Fridays experience isn’t limited to just the Crossroads Arts District. 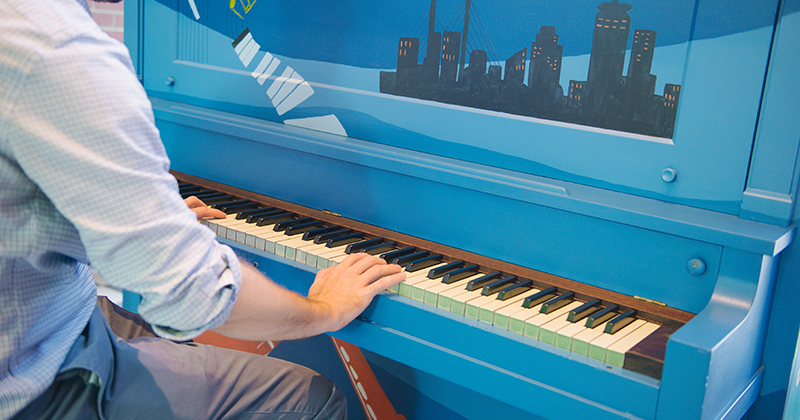 Visitors and residents can experience the original sound and flavor of Kansas City in the 18th & Vine Historic Jazz District with live music, step dancing, exhibits and more. Meanwhile, the First Friday Film Festival celebrates KC’s silver screen culture with free showings at Crown Center’s MTH Theatre, only a short walk or KC Streetcar ride from the Crossroads. The best part? Screenings begin just as many of the art galleries close, so you can go from one to the other without missing any of the action. 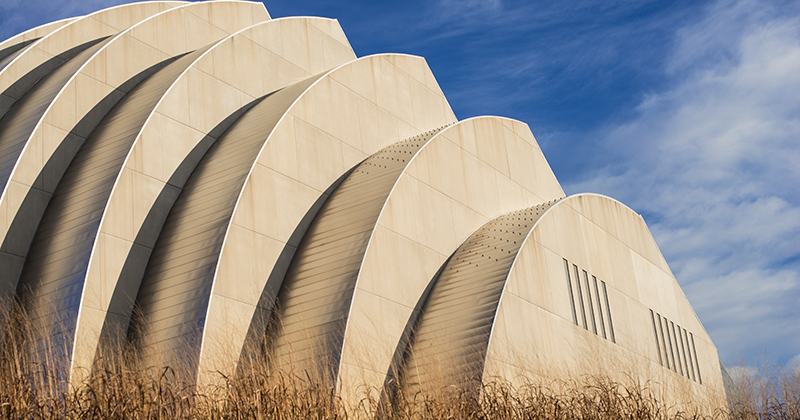 Street parking can be limited during First Fridays but there is also space available at the TWA Building (1740 Main), in the Arts District Garage adjacent to the Kauffman Center for the Performing Arts (1601 Broadway) or in private lots charging around $5. Patrons of Lidia’s Kansas City, Grünauer or Fiorella’s Jack Stack Barbecue may park behind the Freight House.